Update 8/17: The Mandrill content pack has been restored in Power BI, we apologize for any inconvenience. 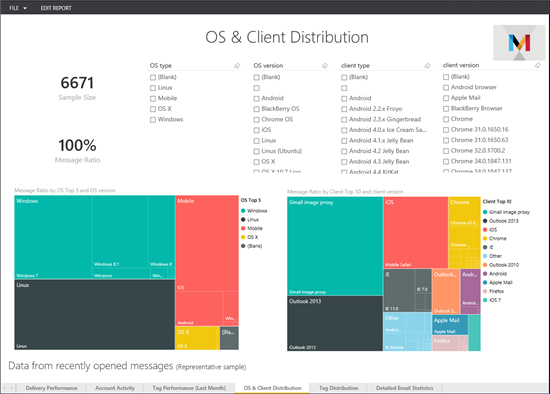 We are always interested in your feedback, please contact us at http://support.powerbi.com. Mandrill is an email infrastructure service developed by MailChimp that lets you analyze your email campaigns from a wide variety of information. 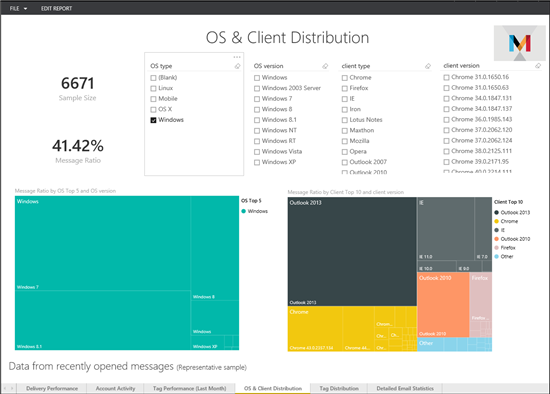 With the Power BI Mandrill content pack, you can quickly connect to your Mandrill data and immediately gain insights into your newsletter or marketing campaign. This content includes an out-of-box dashboard, a set of reports and a curated data set to explore and provide details such as your delivery performance and tag information. This post will detail how the Power BI content pack helps you explore your Mandrill data. 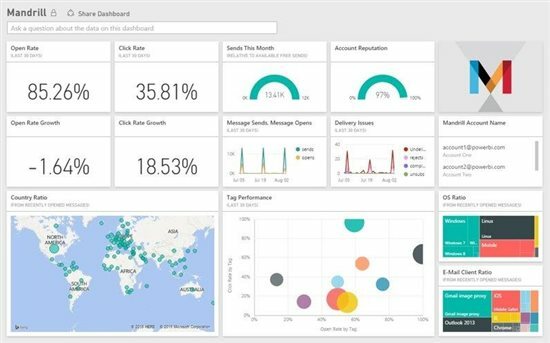 For additional details on how to get started, please see the Mandrill content pack for Power BI help page. The content pack brings in data about the performance of your email campaign from the last month as well as representative data about location, operating system, and e-mail clients from Mandrill. To get started, just log in using one of your Mandrill API keys. The key can be located under the settings tab from Mandrill’s dashboard. A dashboard is automatically created once you’ve provided credentials. You’ll see the new dashboard, report and data set all indicated with an asterisk next to the name. The dashboard is a set of tiles, with each tile displaying a specific metric to monitor from the dashboard view. Select one of the tiles to drill in further to the reports, such as “OS Ratio”. This brings you to the OS & Client Distribution report, one of the several report pages that are included as part of the out-of-box content. Other reports include Delivery Performance, Account Activity, Tag Performance, Tag Distribution, and Detailed Email Statistics. Each tile on the dashboard may lead to different report pages. The reports include a set of visuals with different insights. You can hover over any of the items for more details, or select a particular value to cross filter the other visuals on the page. For example, selecting an OS from the list of OS types in the leftmost list of filters, filters the other visuals to show the impact of that value. After the initial import, the dashboard and the reports continue to update daily. You can control the refresh schedule on the data set. With the Mandrill content pack for Power BI, you have a great set of metrics and insights allowing you to explore your data even further.We’re always interested in hearing your feedback – please contact us at http://support.powerbi.com to let the team know how your experience was and if there’s anything we can do better. We look forward to your feedback!